4th Grade Family Night scheduled for Tuesday, Feb. 12 has been cancelled due to weather conditions and school closing. Look for a reschedule date coming in the future. Due to weather conditions, Davis County Schools will be canceled for Wed. Jan. 30. There will be a 2 hour delay on Thurs. Jan. 31. Buses are hard surfaces only through Fri. Feb. 1. Due to weather conditions, Kindergarten Family Night has been canceled for tonight. Your child will be bringing home a note tonight. Sorry for any confusion. Elementary Parents: Please make sure you call the office and let us know what your student's after school plans are by 2:00 p.m. This is especially important when we are running on hard surfaces only to make sure we are getting your student on the right bus. Please call the office if you have any questions. Buses will be running on hard surfaces again Tuesday, January 15, 2019. Please check Facebook or daviscountymustangs.com for the Hard Surface Routes Map. Elementary Winter Spirit Week has been really fun! Thursday is Winter Sports Day and Friday is Wacky Winter Day! Please call the office if you have any questions. Winter Dress Up Days at the Elementary Monday December 10 - FLANNEL DAY - Wear your favorite flannels! Tuesday December 11 - PAJAMA DAY - Wear your pajamas! Wednesday December 12 - UGLY SWEATER DAY - Wear your favorite ugly sweater or your favorite holiday color! Thursday December 13 - WINTER SPORT DAY - Dress as your favorite winter sport or wear a jersey from your favorite team or wear Mustang/gold & burgundy gear! Friday December 14 - WACKY WINTER DAY - Wear your craziest Christmas socks, winter leggings. elf/santa costumes, fun accessories! Make it fun! If you have any questions, please do not hesitate to contact the Elementary office! Davis County Schools would like to thank the community for their support of our new security doors and the patience they have shown to us while we figure everything out. The Elementary doors will now remain unlocked so that the community can enter through them for the Middle School Gym Basketball Games! We are truly sorry for any inconvenience this may have caused and encourage you to continue your support of Davis County Mustangs! Elementary Parents: When navigating our new website: Go to dcmustangs.com, choose Schools, then Elementary. You should scroll down and see NEWS on the left side. Click where it says SEE ALL NEWS. You can then choose from a variety of our calendar events and see all the details you will need to know. Please call the Elementary office if you have any questions. Elementary parents: Children will be going outside as long as the windchill and temp is above zero. Please send snowpants and boots with your child. Without snowpants and boots, they will have to stay on the concrete surface. If you have any questions, please call the office. Due to our new Security Doors, those wishing to attend the Middle School Basketball games will need to enter through the Middle School doors after 4:00 p.m. Elementary Doors are to remain locked. Thanks for your cooperation! Good Morning to all! It's a short week for school - only 2 days! Remember to get your after school transportation changes called into the school by 2:00 p.m.! NO SCHOOL on Wednesday, Thursday and Friday. Happy Thanksgiving Week! Picture Retakes are Friday, November 16, 2018. Please ask in the school office if you need a packet. We do have a very few! Please call the office if you have any questions! Get your smiles on! Elementary School Pictures should have been sent home this week. If you purchased a package and did not receive it, you will need to call B & C Pictures at 866-505-6998. Picture retakes will be Friday, Nov. 16, 2018! 1st Grade parents can access the note that went home today about next week's field trip by going to the website and choosing Elementary as school, then choosing documents at the bottom left of the page and then Notes Going Home. 12:30 Early Dismissal will be happening on Thursday, November 1, 2018. Please make sure to call the Elementary office at 641-664-2200 ext. 1146 and let Kasey know what the after school plan for your child is! We are already compiling our list! The Elementary School is celebrating Red Ribbon Week and Anti-Bullying Month. To show support, we will be wearing ORANGE on Wednesday, October 31, 2018! If you have any questions, please contact the office @ 641-664-2200 ext. 1135. Take time to check out our new website. We have lots of great information going on there! Go to dcmustangs.com, choose the school you want. There will be news, events and a live feed to keep you informed. You can access PowerSchool & RevTrak. From the menu tab, you can access forms & lunch menus! As always, please call the school office of your choice at 641-664-2200 if you have any questions. There are a few books right outside of the office that are FREE for the taking. Be sure to check these out! Don't forget to stop by the Elementary Book Fair while you are here for conferences! You can find them in the library! There are a lot of great deals! Parent Teacher Conferences are from 4:30 - 8:00 p.m. tonight! Elementary parents should call the office if you have any questions about your conference time. PLEASE CHECK OUT OUR LOST AND FOUND while you are in the building. There are a lot of nice jackets/coats/hats, etc there! Don't forget that tonight is a Preschool Family Night from 5:30 - 6:30 p.m. If you have any questions, contact the Elementary Office at 641-664-2200 ext. 1146. Please remember that the Book Fair will be starting Friday, October 26 and run through November 1. It will be open during the school day and during parent teacher conferences. If you have any questions, please contact the office at 641-664-2200 ext. 1135. Elementary Students: Don't forget to wear some RED on Wednesday in honor of Red Ribbon Week! Call Lisa at 641-664-2200 ext. 1135 if you have any questions. Davis Co Elementary School is celebrating Red Ribbon Week (Oct. 23 - 31) and Anti Bullying Month (Oct) by hosting a few fun activities. On Oct. 24th, we will be wearing RED in support of Red Ribbon Week. On Oct. 31st, we will be wearing ORANGE in support of Anti-Bullying Month! 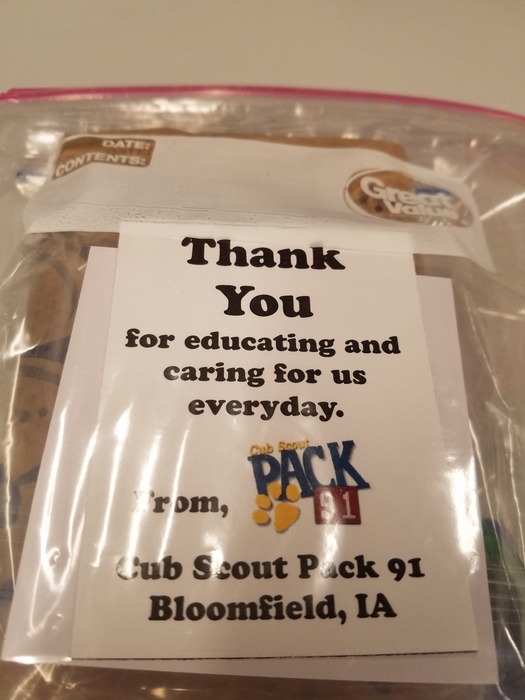 Thanks so much to Cub Scout Pack 91 for the staff survival kits! They were very much appreciated! Parent Teacher Conference Notes are going home with the Elementary kids this week! Please make note of your time & date for conferences! If you have any questions, please do not hesitate to contact the office at 641-664-2200 ext. 1135. It's a Moody Monday! What helps you chase the Mondays away? Don't forget that on Monday, October 15, 2018, there is no school! We have a professional development day! Shout out to all the parents out there! The elementary school nurse's office is completely out of sizes 4, 5, 6 & 8 pants and underwear for boys and girls! We prefer elastic waste pants! If you have any extras you can spare, please send them to the elementary school! If you have a preschool or Kindergarten student, please make sure you are sending an extra pair of clothes with them in their backpack every day! If you have any clothes belonging to the school at your home that you could wash and send back, we would really appreciate it! Some conference notes may have went home with the wrong dates on the sheet. Conferences are Monday, October 29th and Thursday, November 1st! You can print a corrected note from the website OR you can just write it on the note that went home. Sorry for the mistake! By going to dcmustangs.com and choosing Elementary School, then choosing Documents, you can see notes that go home with students from the office or from their teachers! Under the Documents Section of the website, you can find our Box Tops for Education letter and form! School pictures for 2nd, 3rd and 4th grade are Thursday, October 11 in the morning! Get your smiles on! School Pictures for Preschool, Kindergarten and 1st Grade are Wednesday, October 10 in the morning! Get your smiles on! Kindergarten Family Night is tonight from 5:30 - 6:30! See ya there! Parents In Education or P.I.E. for short will have a meeting on Thursday, October 11, 2018 in the elementary library @ 6:00 p.m. All parents are invited and encouraged to come! P.I.E. does lots of AWESOME things for our elementary school! Hope to see new faces there! Preschool and Kindergarten parents: please send an extra set of clothing in your child's backpack everyday for those "just in case" accidents! We would really appreciate it! The Elementary Nurse's office is needing Size 4/6 Elastic waist knit pants, sweatpants and underwear for both boys and girls! Please only this request as we are full of other sizes! Thanks! Happy Friday everyone! Create the Highest, Grandest Vision Possible for your life, because you become what you Believe!